Oxford Castle was constructed in 1071 re-using earlier Saxon defences. It saw action during the Anarchy where it was the scene of Matilda’s dramatic escape from King Stephen in the midst of a snow storm. Later Oxford served as the Royal capital during the Civil War and thereafter was used as a prison until 1996. Oxford was located at a fording point on the River Thames and was also on a key trading route between the Kingdoms of Mercia and Wessex. In the eighth century AD St Frideswide monastery was founded there and a thriving market town known as ‘oxen-ford’ developed. Oxford was converted into a burh (fortified town) during either the late ninth or early tenth century AD. Burhs were a means of concentrating economic activity making it both taxable and defendable. This gave the Kings of Wessex the ability to resist the Danes who occupied much of central and northern England at this time. The precise date of foundation of the burh is disputed and there were certainly two distinct phases. The first settlement enclosed a broadly rectangular area extending east from the River Thames and some authors suggest this was established circa-AD 879. This would have followed King Alfred the Great's victory at the Battle of Edington (AD 878) after which he took control of the area that now forms Oxfordshire and Buckinghamshire (then central Mercia). 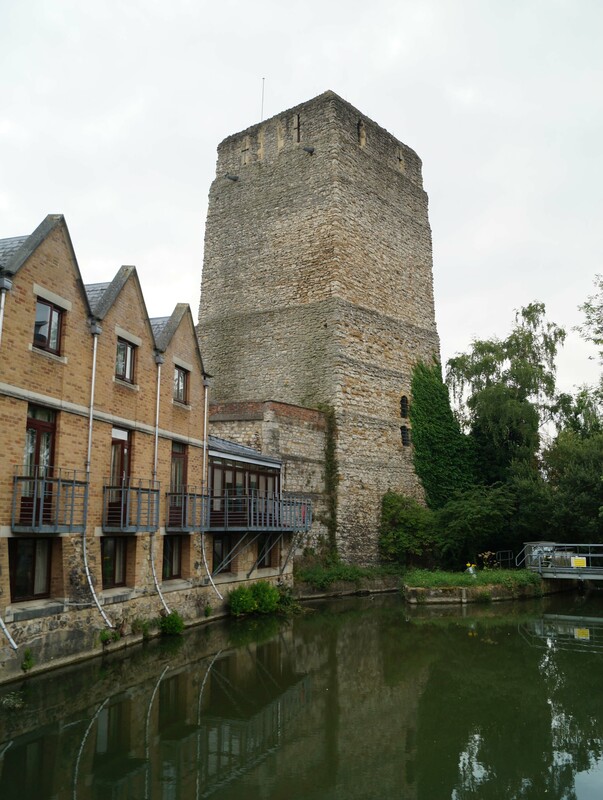 Oxford's defences were then expanded during a second stage of development when the boundary was extended further east towards the River Cherwell. This may have been around AD 911. 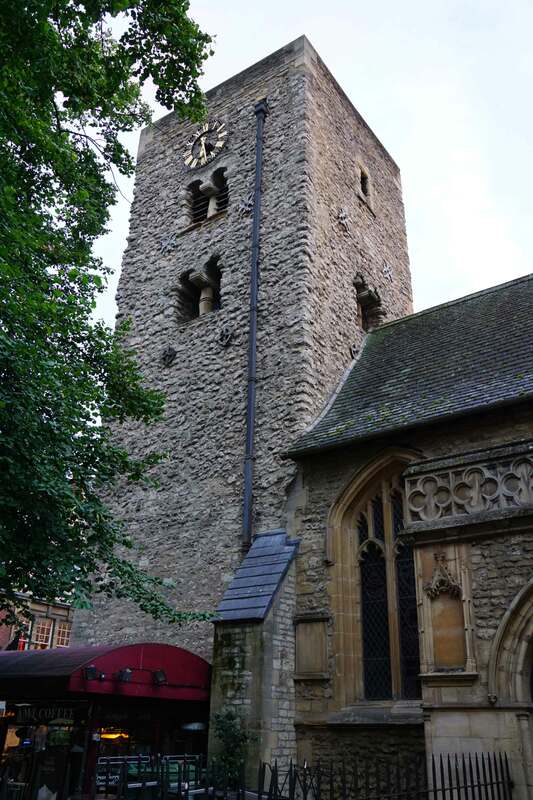 By the tenth century the burh had four gates providing access with each protected by a tall stone-built tower - St George’s Tower (which guarded the West Gate) and St Michael’s Church Tower (which guarded the North Gate) still survive. The curtain wall itself may have been built with stone and was fronted by a ditch. However, the defences didn’t prove entirely successful as Oxford was attacked and burnt by the Danes in 1009. Following the Norman invasion, Oxford was identified as a strategic location. Accordingly William I granted it to Robert d'Oilly, one of his key supporters, who built an earth and timber motte-and-bailey castle around 1071. The mound itself was partly built over the original Saxon burh wall whilst the bailey defences incorporated the existing stone-built St George's Tower. Water from the River Thames was diverted to provide a flooded moat. 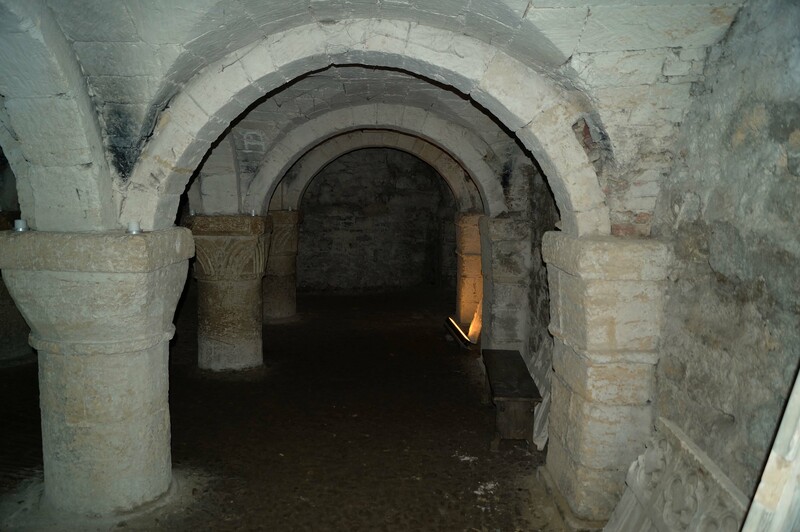 Robert also founded St George’s chapel inside the castle’s bailey, possibly replacing an earlier Saxon church. In 1135 Henry I died without leaving a male heir and England descended into civil war, known as the Anarchy, over the English succession. Following the old King's death, his nephew - Stephen of Blois - took the throne but he was opposed by Henry's daughter, Matilda. By 1142 each faction had their own geographical sphere of influence and Oxford was on the frontier between them. In 1142 Stephen launched a surprise raid on Oxford and besieged the castle trapping Matilda inside. However, she made a daring and successful bid for freedom when she crept from the castle in the middle of winter draped in a white clock to conceal her escape against the snow covered landscape. She fled to nearby Wallingford Castle and Oxford surrendered the following day. William de Chesney was appointed as its new Constable. The war came to an end in 1153 with an agreement that Stephen would remain King for life and thereafter be followed by Matilda's son, Henry. The latter assigned the castle to Roger de Lucy in 1153. 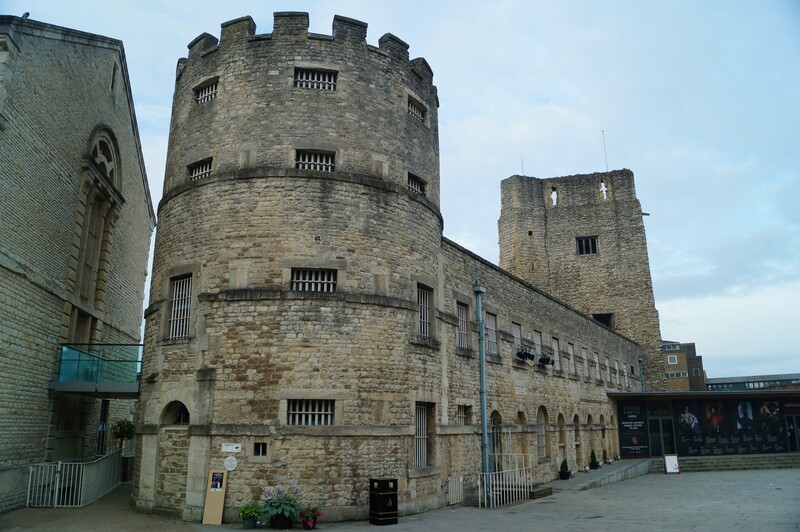 Oxford Castle was extensively upgraded during the late twelfth/early thirteenth century. The motte was heightened and the wooden tower/palisade that originally crowned it was replaced with a ten-sided stone shell Keep (probably similar in style to that seen at Arundel or Cardiff). A chamber for the castle's well was sunk into the enhanced motte. Later a barbican was constructed and the bailey curtain wall rebuilt in stone along with additional towers. The upgrades proved timely for the First Barons' War erupted in 1215 after King John annulled Magna Carta. Oxford Castle was held on behalf of the King by Fawkes de Breauteacute but baronial forces besieged him there in 1216. The advance of the Royal army saved the site from falling. After the Barons' War the castle assumed a more peaceful role as Oxfordshire’s gaol (although it wouldn’t be formally acknowledged in this function until 1531). The first recorded prisoners, misbehaving students from the town’s University, were detained in 1216. Whilst some upgrades were made to the castle during the thirteenth century, the majority of expenditure on Oxford's defence at this time was directed towards the town walls. In 1226 Henry III granted murage to upgrade them and, in addition, thirty-four landowners were ordered to financially contribute to the work. When they refused, some had their property confiscated. The upgrades consisted of enhancing the (existing) stone wall and building around thirty D-shaped bastions to augment it. A deep ditch also fronted the defences and, at least on the north-eastern side, this was augmented with an outer wall providing a concentric set of defences. However, by the late fourteenth century the defences of both castle and town wall had been neglected. Oxford Castle was sold into private ownership in 1611 but, upon the outbreak of the Civil War in 1642, the castle was hastily reactivated and elaborate earthworks constructed around the town. The first battle of the English Civil War was fought at Edgehill in October 1642 and, although a Royalist victory, King Charles' subsequent attempt to re-capture London failed thus he made Oxford his wartime capital. The King took over Christ Church college whilst the castle was utilised as a prison for captured Parliamentary soldiers. Under the scrutiny of Marshall William Smith, the prisoners were held within St George’s Tower and the conditions they endured were dreadful. No sanitary facilities were provided effectively meaning dozens of prisoners were left crammed in a small cell wallowing in their own waste. One of these prisoners - Edmund Chillenden, a young officer in the Parliamentary army - was held there between December 1642 and May 1643 but he escaped and published a pamphlet, ‘The inhumanity of the King’s Prison Keeper at Oxford’. Despite various Parliamentary attempts to attack Oxford during the war, the town remained firmly in Royalist hands throughout aided by various outlying garrisons and the presence of the King's Field armies. However, after the battles of Marston Moor (1644) and Naseby (1645), the Royalist armies were destroyed and Parliamentarian efforts shifted to dislodging Royalist garrisons. Oxford was besieged in early 1646 by Sir Thomas Fairfax. It fell in June 1646 and the defences around the town and the medieval walls of the castle were slighted to prevent further military use. 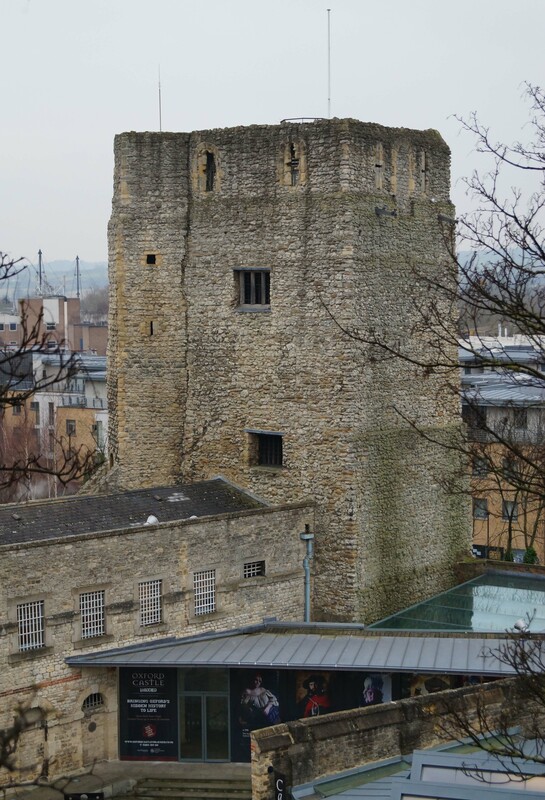 Only St George’s Tower was left standing due to its use as Oxford’s prison. Although the partial demolition of Oxford Castle ended its defensive function, the ruined site continued to be used as a county prison for Oxfordshire and Berkshire. 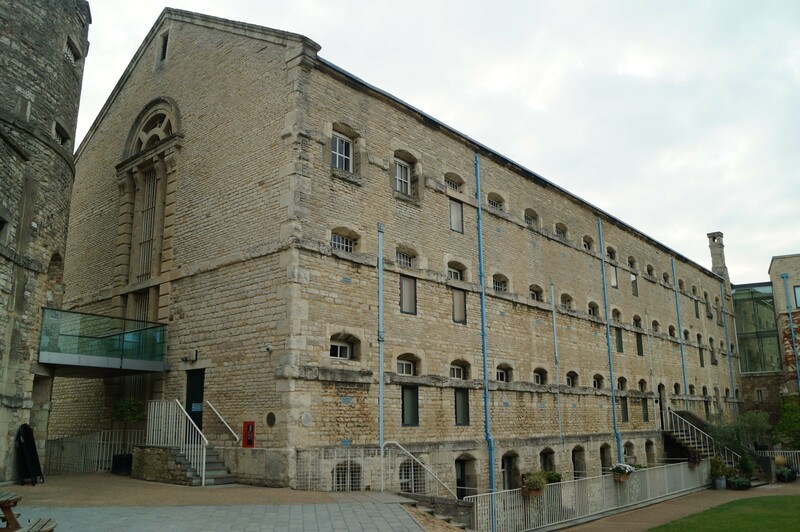 It was heavily criticised in the 1770s by the famous prison reformer John Howard and this partially prompted a major rebuilding programme between 1785 and 1805 with further upgrades made in 1876. Aside from the prison, other developments also encroached upon the original perimeter of the castle. New Road was constructed in the late 1700s, a County Hall in 1840 and an armoury for the Oxfordshire Militia was added in 1854. The bulk of the castle remained occupied by Her Majesty's Prison Oxford until 1996 when the site was decommissioned. Today it is occupied by various commercial outlets and a hotel alongside the Prison/Castle museum. Haslam, J (2010). The two Anglo-Saxons Burhs of Oxford. Hill, D.H and Rumble, A.R (1996). The Defence of Wessex: the Burghal Hidage and Anglo-Saxon Fortifications. Manchester University Press, Manchester. Lavelle, R (2003). The Fortifications of Wessex c800-1066. Osprey, Oxford. Saltar, M (2002). Medieval Walled Towns. Folly Publications, Malvern. Oxford Castle was slighted by Parliamentary forces after the Civil War and much of the site was rebuilt during the eighteenth and nineteenth centuries. The site is now used by various commercial outlets and a hotel but significant portions of the original castle survive including the motte, a Saxon Tower and a Norman church crypt. The prison facilities also survive and now form part of a museum. The 'Oxford Castle Unlocked' attraction allows access to all of these areas. 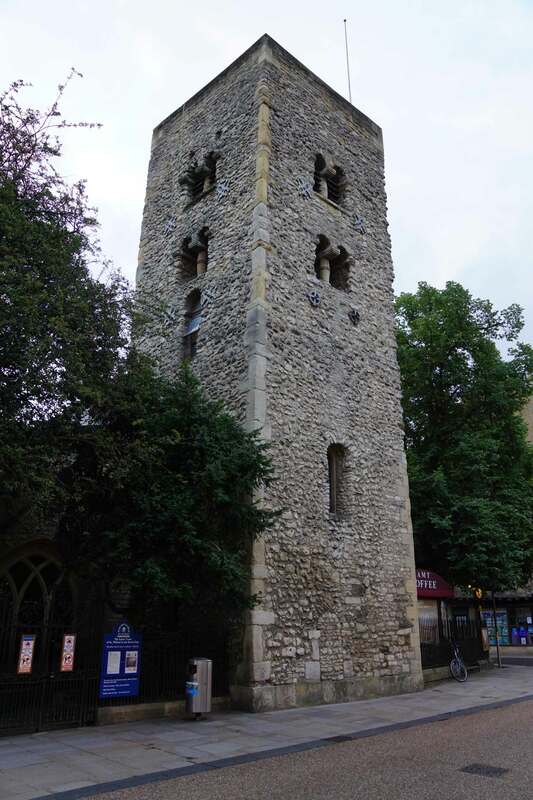 A second Saxon Tower also survives and is now part of St Michael’s church on Cornmarket Street. Around one-third of the Oxford town wall survives but much is hidden from view behind privately owned properties. Oxford Castle and Town Wall Layout. The Saxon burh evolved in two stages with the first founded circa-AD 879 followed by an extension in AD 911. The castle was built straddling the existing defences and incorporated one of the Saxon towers in its defences. By the thirteenth century the town walls had been rebuilt with D shaped bastions and had six gates penetrating its perimeter. St Michael's Church. The tower of the church was one of the Saxon towers built to defend the burh. It is open to the public. St George's Tower. 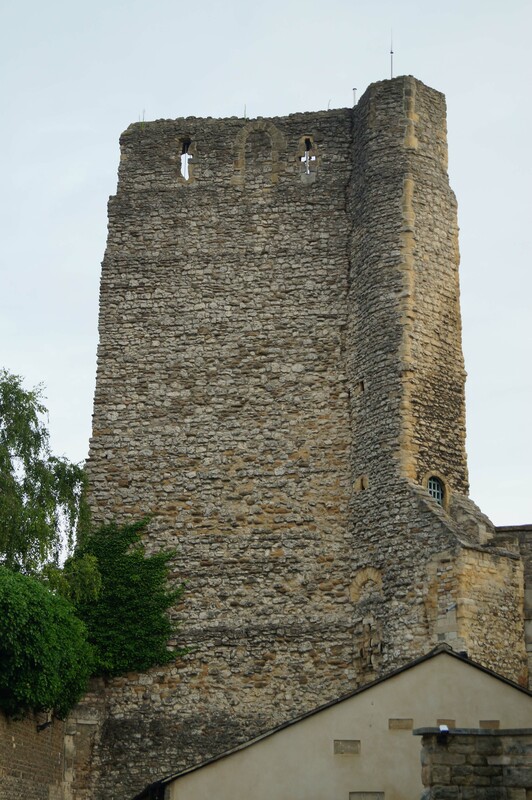 St George’s Tower was part of the Saxon burh and later incorporated into the defences of the Norman fortification. It was in this tower where the Parliamentary prisoners were held in squalid conditions during the Civil War. 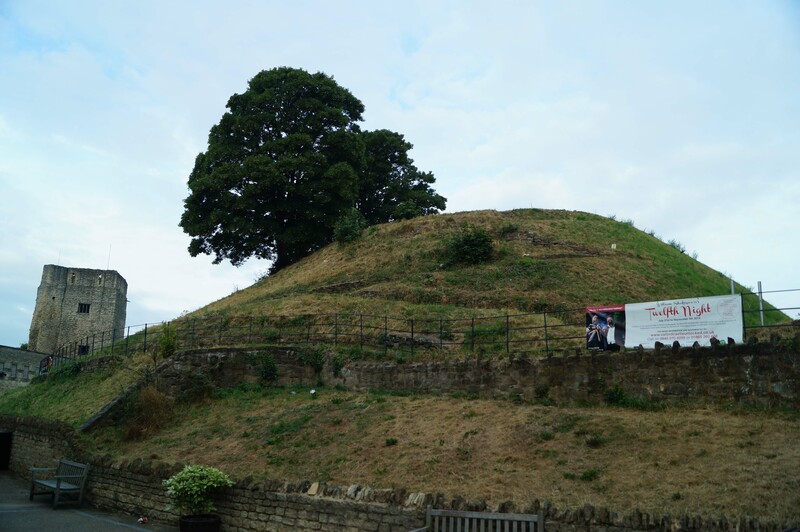 Oxford Castle Motte. The motte was built straddling the Saxon defences and was originally topped with a timber tower. 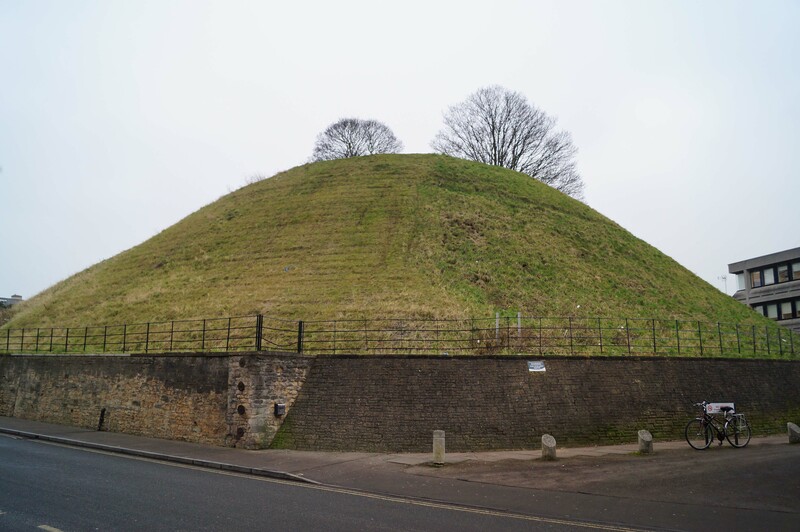 The mound was enlarged during upgrades in the late twelfth or early thirteenth century. Prison A-Wing. This was built in 1852 and was modelled on Pentonville prison. It had 150 cells each intended for a single prisoner but, by the time it was closed in 1996, three men routinely shared each cell. Debtor's Tower. The debtors prison was built in 1790 and was separate from the main prison. Prison. The prison grounds have now been modified and now function as a hotel. Oxford Castle is well sign-posted and the tall motte and tower are clearly visible as you approach. There is ample (pay and display) car parking in central Oxford with the nearest option shown below.